A good moussaka is a joy to behold with cinnamon spiced lamb mingling with aubergines and a delicious creamy sauce. It is something I’ve always wanted to make but never have until my friends and I decided to have a Greek night. Perfect chance. I don’t know why I’ve not made one before. It’s extremely comforting and flavourful and well worth the effort. Sprinkle the aubergines with salt and place them (stacked) in a large colander. Leave to sweat for 30 minutes, then brush off excess salt and pat dry with a paper towel. Preheat oven to 200C. Lay the aubergine onto 2 large baking trays, brush with olive oil and bake for 10 minutes or until just softened. Remove and set aside to cool. Heat olive oil in a pan over medium high heat then cook the garlic and onion for 3 minutes. Add the lamb and cook, using the wooden spoon to break up the mince as you go. Add the flour and herbs and stir. Add remaining ingredients and bring to a simmer, then cover, lower heat to medium low and cook for 15 minutes. Melt butter in a pan over medium heat. Add flour and cook for 1 minute, using a whisk to keep it moving. Add 1 cup of milk and whisk to combine. It will thicken quite quickly. Add the remaining milk. Whisk until smooth then cook for 3 to 5 minutes or until it thickens so that it thickly coats the back of a wooden spoon. Remove from the stove and whisk in cheese. Allow to cool for 5 minutes then whisk the eggs in. Place half the filling in the bottom of a baking dish then half of the aubergine in a layer on top. Repeat the process with the remaining filling and aubergine. Pour over the béchamel sauce, sprinkle with breadcrumbs and a little extra grated cheese and bake for 30 – 40 minutes or until golden brown. A cheese sauce that’s vegan, dairy free, tastes amazing and is good for you. Stuff of dreams, right? Wrong! This vegan queso dip is actually made from aubergines that have been grilled and finely blended with spice and garlic for a silky sauce that is great for dunking, spreading and pouring on all things Mexican. I made this for a dinner night with my friends and yes, there’s always one who can’t eat anything but I presented her with this and she absolutely loved it. So did all the meat eating, dairy tolerant girls too! OPTIONAL: Smoked paprika and hot sauce for added colour and flavour upon serving. Sprinkle both sides of the aubergine slices with a little sea salt and arrange in a colander to help draw out some of the moisture and bitterness. Let set for 10-15 minutes then rinse with cool water and thoroughly pat dry between two clean towels. Preheat grill to high and place an oven rack near the top of the oven. Arrange the dried aubergine rounds on a baking sheet lightly spritzed with non-stick spray. Sprinkle with a very small amount of salt. Grill on high for 4-5 minutes on each side, watching carefully as to not let them burn. Flip at the halfway point to ensure even cooking. Once the aubergine appears tender and both sides have golden brown colour, remove from the oven and wrap loosely in foil to steam. After a few minutes, unwrap and peel the aubergine skin away. It should come right off. Place aubergine in a blender with the 1.5 cups (to start) oat milk, minced garlic, cumin, chili powder and corn flour and blend on high until smooth and creamy. Taste and adjust seasonings as needed. To thin, add more oat milk. Transfer to a small saucepan and warm over medium to medium heat until slightly thickened and bubbly – about 5 minutes. The longer you go the thicker it will become. NOTE: If it isn’t looking as thick as you want, thicken with a slurry of corn flour by adding an additional 1 tsp corn flour to a small bowl with a little oat milk. Whisk to combine and then stir back into the pan. This should thicken it right up. Serve with nachos, salsa, crackers or veggie sticks. Refrigerate and cover leftovers. Reheats extremely well in the microwave or in a saucepan. This will keep for up to a few days but is best when fresh. It can be enjoyed hot or cold. I like mine on a massive nacho stack! 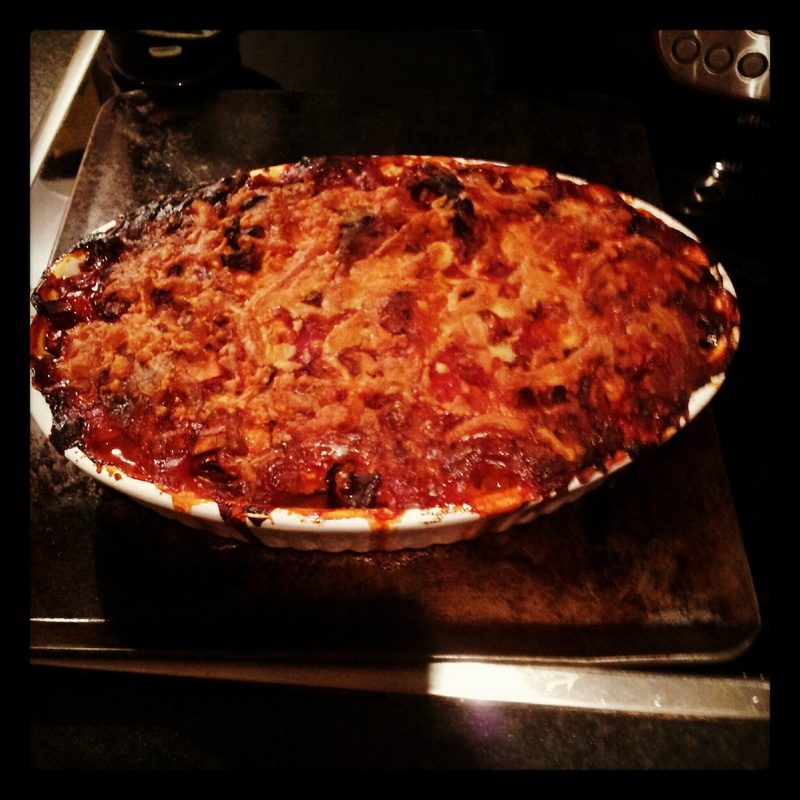 This recipe came about when trying to find a vegetarian dinner with an Italian theme that I could cook with my best mate. It is not a traditional Italian recipe as we added loads of chunky vegetables to the sauce to suit our taste. The aubergine is sliced very thinly and par-baked first so it becomes roll-able and then acts as cannelloni would to hold a tasty spinach and cheese filling. A word of advice: Make sure you have a a nice big baking dish that will definitely hold all the ingredients as you will need to cover it with foil during the first part of baking and you don’t want it to press on the top of your dish. Don’t do as we did which is to pile it all into a smaller dish, run out of foil and have to balance another tray over the top which fell off and spilled half our cheese topping all over the inside of the oven (woops). To make the tomato sauce, heat a teaspoon of oil in a pan and fry the chopped onion, garlic and peppers until softened. Add the mushrooms and herbs and continue to fry until softened. Add the passata, reduce the heat to low and let the sauce simmer for 5 minutes. Set aside. Remove the aubergine ends and slice them thinly. Spray a baking sheet with olive oil and place 12 aubergine slices on it. 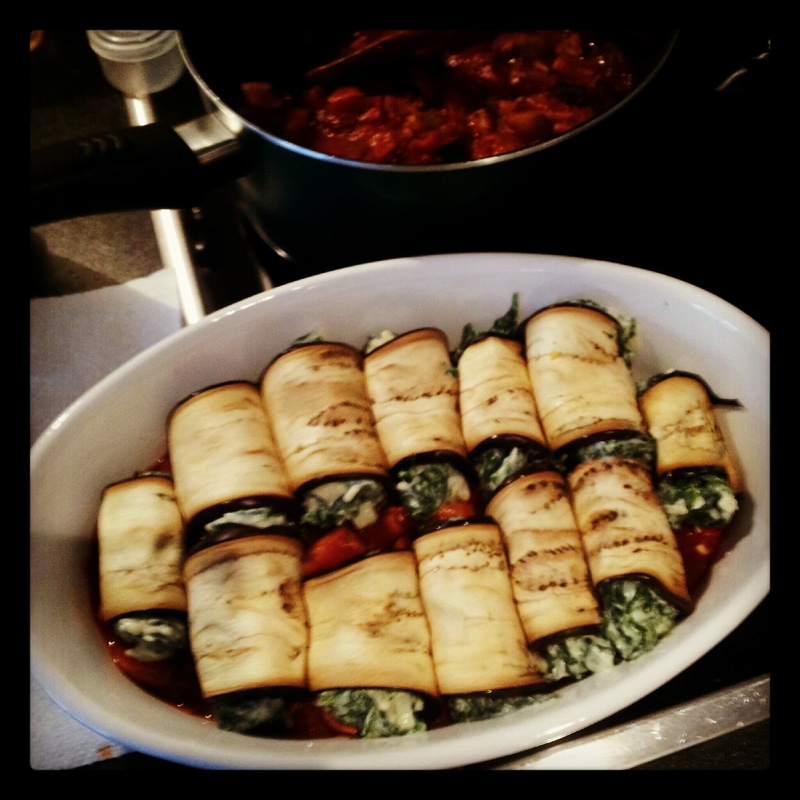 (You may need to use two baking sheet or bake the aubergine in two batches depending on the size of your oven). Bake for 10 minutes, remove from the oven and let cool. While the aubergine is cooking, prepare ricotta and spinach mixture. In a bowl, combine ricotta, mozzarella (50g), parmesan, spinach, egg and garlic. Mix well and season to taste. Spread 1/2 the chunky tomato sauce on the bottom of a large baking dish. Generously spread ricotta/spinach mixture on an aubergine slice (about one heaped tablespoon), roll it and arrange on top of the sauce in the dish, seam side down. Continue with remaining aubergine slices. Top with remaining tomato sauce and sprinkle with remaining mozzarella (100g). Cover with foil, reduce oven to 180C and bake for 45 minutes. Remove foil and bake another 15 minutes or until cheese is golden brown. Remove from the oven and serve. In warm water, mix sugar and instant yeast and let it rest for 5 minutes. The yeast will bubble up. This process is called ‘activating’ the yeast. Place the ball of dough in a well oiled bowl, cover with cling film or a damp kitchen towel and let it rise for 90 minutes or until it doubles in volume. Cut the pizza dough into equal pieces (16-24 depending on how big you like your dough balls). 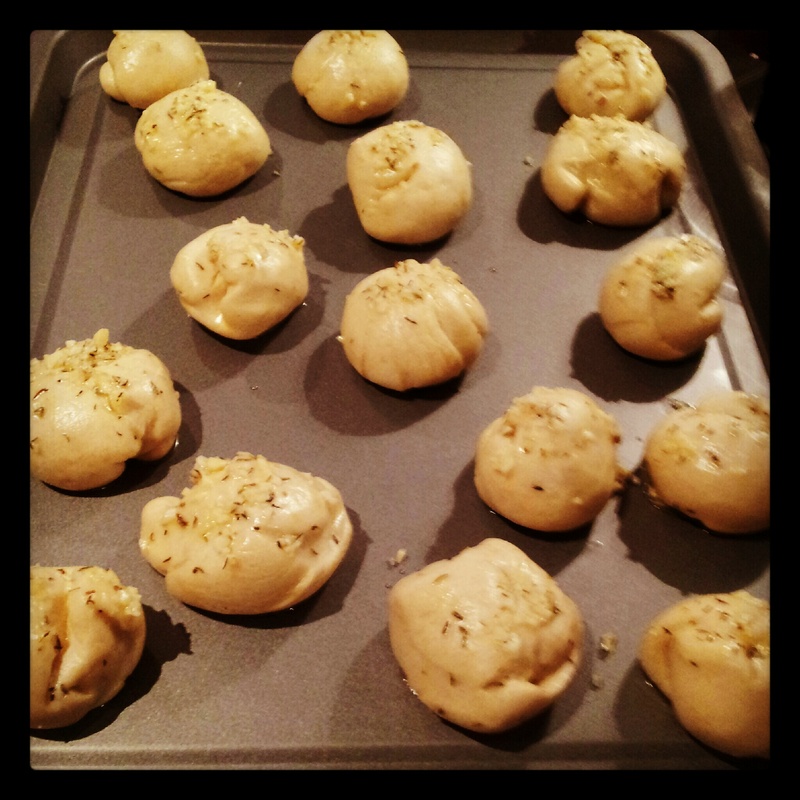 Roll each piece between your palms to form small balls of dough. Place the balls on a baking pan at least ¼ inch apart from each other. Meanwhile, mix the garlic with melted butter, salt and herbs. Preheat your oven to 200C. Brush all the balls with the garlic butter (if any garlic pieces are left behind, place them on any of the balls). If you like, sprinkle your favourite herb on top of the balls. Bake them for 20 minutes or until the balls are golden brown and fully cooked through. These are great dunked in the chunky, cheesy tomato sauce, just don’t plan on going to near anybody after eating them (unless they’re a vampire that you need to get rid of).